The master sushi chef of two Michelin-starred Sushi Ikko in Hokkaido will travel to Singapore to train Shoukouwa's team of sushi chefs. In the realm of world class fine-dining edomae sushi, it is the little things that make all the difference. Of course, in the case of restaurants like Shoukouwa at One Fullerton, it’s a boon to have a chef with a proven eye for details at the helm. 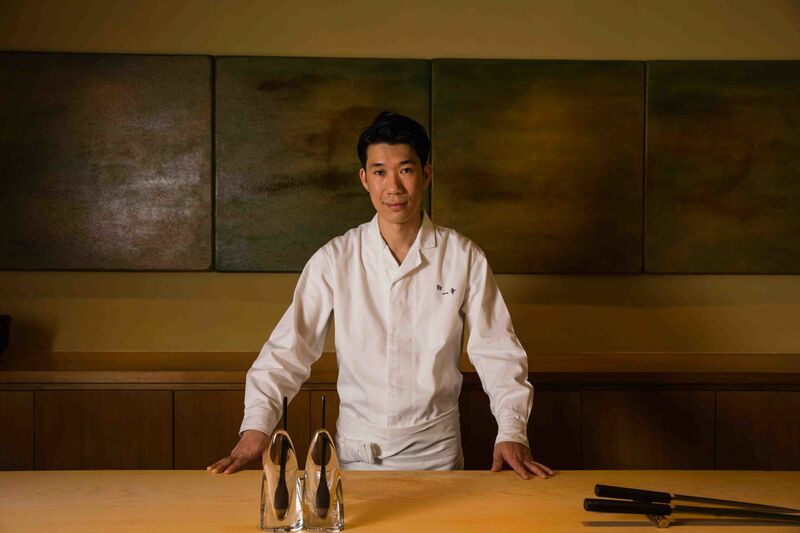 That being said, after earning its second Michelin star in June last year, the almost two-year-old sushi-ya, which is under the Emmanuel Stroobant Group Luxury Collection, announced a new partnership, this time with master sushi chef Junya Kudo (pictured) of two-Michelin-starred Sushi Ikko in Hokkaido. The 36-year-old master sushi chef will be providing intensive culinary training and consultancy to its team of sushi chefs to refine and maintain Shoukouwa’s fine cuisine standards, the company explained in a press release early this week. It is a surprisingly sudden move, which also lends some insight into the growing offering of top-notch sushi restaurants, both here and in Japan. “It was an exciting opportunity to work with Shoukouwa, and I’m proud to witness the restaurant achieving its two Michelin stars in the first two years of business,” Shoukouwa’s former head chef Masakazu Ishibashi tells us. He explains that the main reason for his move to Tokyo is to open his own restaurant in the famed food capital. “Starting my own restaurant has always been my dream and one I had to pursue given the right opportunity,” the Tochigi-native adds. This new partnership with Kudo is also an opportunity for the chef to increase his reach, “to introduce the courses that I serve in Hokkaido to other international diners in Singapore”, he muses. There might even be a chance of having a meal prepared by Chef Kudo himself, as he will be travelling to Singapore every quarter to provide training and consultancy, and oversee the restaurant’s regular supplies from Japan. Kudo was in town early this month to kick off the training sessions, and will be back again in March. And despite what sceptics might say, he assures that there is a lot of what makes his brand of sushi so appealing to be enjoyed at Shoukouwa. “The courses I showcase at Shoukouwa are a reflection of my life and culinary journey, and every course is a signature dish on its own (with its own story),” Kudo clarifies, adding that the cuisine and dining experience at Shoukouwa will be very similar to dining at Sushi Ikko. Born and raised in Makomanai City, Hokkaido, Kudo's talent was evident when he was just six years old, when he learned to create a makimono on his own just from observing. He spent his early years acquiring the finer skills from his father, the Founder Master Chef of Sushi Ikko, and at age 18, formally began his career as a sushi chef at the restaurant. He eventually took over as a head chef at age 25. Despite difficult economic times, and driven by an appreciation of the cuisine’s refined and evolving nature, even one as traditional as sushi, Kudo invested 10 years of his time and money learning more by eating and observing at high-end sushi restaurants. Under his talented craftsmanship, Sushi Ikko earned a Michelin star in 2012 and a two-star rating last year. For those inspired to visit, note that the management has also decided to offer just two menus: The Mio lunch menu and the Hana Omakase menu for the full experience. Co-owner Emmanuel Stroobant sees this partnership as a strategic move to bring Shoukouwa to new heights. And that plan will involve some prized and complementary tipples, too. Complementing the premium selection of sake—by the likes of Sawaya Matsumoto, Hakurakusei and Masuizumi—which are already available, a new list of Wine Advocate-rated sakes will be added. This is also the first time Wine Advocate has released an exclusive range of sakes, all featuring a rating of 90 points and above.